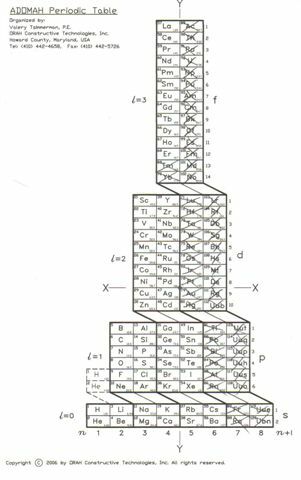 Due to its functional architecture, ADOMAH Periodic Table provides the most convenient and logical way of deriving electron configurations. Same thing can be done for any element with atomic number less than 120. 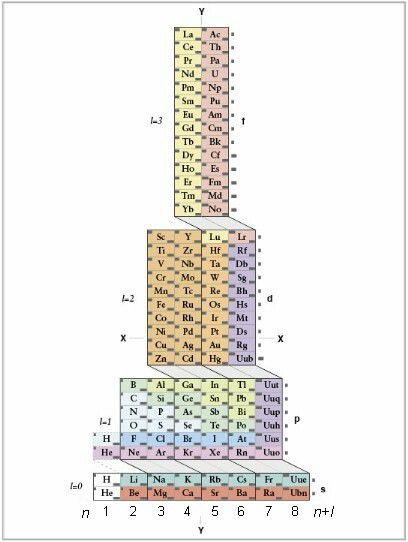 Simply ignore all elements that have greater atomic number than the element you selected and count remaining elements in each vertical column (straight down). where first number in each group of three characters corresponds to electron shell (column number), the letter corresponds to the electron orbital (subshell) and the third number corresponds to number of electrons in that orbital. 1S2 2S2 2P6 3S2 3P6 4S2 3d10 4P6 5S2 4d10 5P6 6S2 4f12. This is so logical and simple ! Compare this with the standard or any other Periodic Table. To start using this simple method of deriving electron configurations, print copy of the ADOMAH PT (PDF) HERE. For further discussion on writing electron configurations in order of orbital filling refer to this blog by Eric Scerri.